You can use arrays (multiple variables) in VBA to speed up code - and they are also invaluable for processing CSV files and the like. This blog is part of our Excel VBA tutorial. We also run training courses for businesses or individuals in Microsoft Excel and in VBA programming. Nearly every array I've ever used in VBA has been dynamic: that is, I haven't known how big the array would end up being when I first declared it. 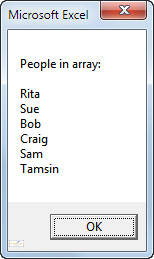 Suppose that you want to read all of the names in column A into an array, but you're not sure how many there will be. The VBA code below would show a message containing the people found. Note the use of the keyword Preserve. Without this, Excel would create a new array containing one more value than the predecessor - but lose any previous contents in the process. Redimensioning an array like this takes a copy of the old array and puts it into a new one. For 6 names this will run like lightning, but for 6,000 you'll start noticing speed issues. Increment the number of people found to one more than it used to be. Increase the size of the array, being careful to preserve any existing values. Store the name just found in the last array entry (the one we've just created by extending the array). 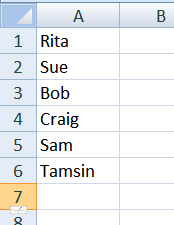 This is a good example of when we gained nothing by using an array - we could have just read in each cell's value and then printed it out directly to the Immediate window.